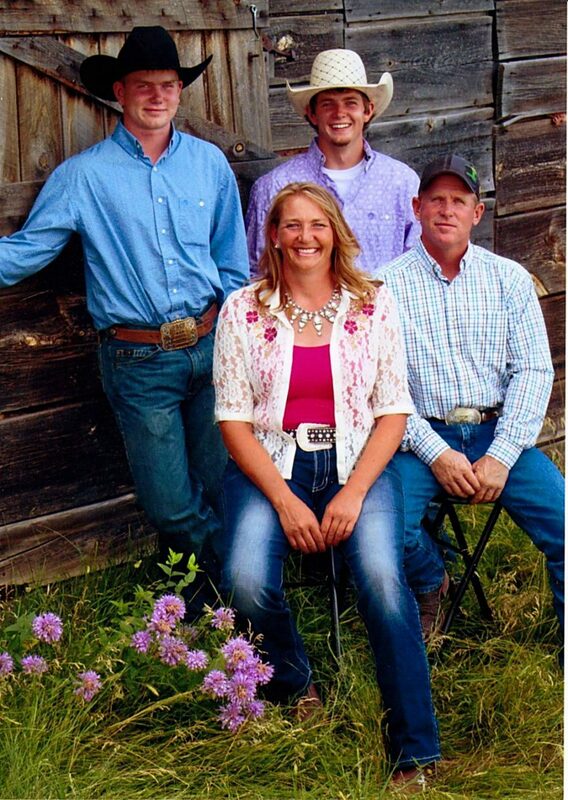 Kyle West and his family run half of the ranch. Lisa says Kyle has been Douglas’s right hand man since he was a boy. Rockypoint may not be more than a small dot on the map to most people, but to the West family, that small dot in northern Campbell County, Wyoming, has been home since 1906 when Douglas West's grandfather and his siblings moved from north central Nebraska to the northeast corner of Wyoming. Douglas's grandfather was a school teacher who homesteaded a 420-acre tract of land upon arriving in Wyoming. It was Douglas's father who got serious about ranching and slowly began adding onto the home place. 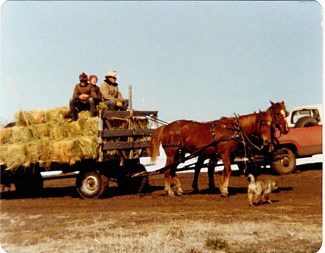 Upon his passing Douglas was able to purchase the ranch from his siblings and continue to add on and grow the operation. 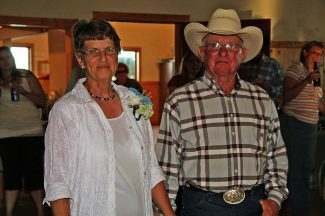 Today, although the 75-year-old Wyoming rancher is retired, two of his children, along with their spouses, continue to keep the ranch in the family. 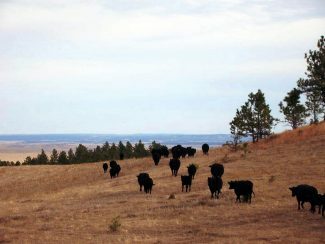 Up until 20 years ago, the West Ranch ran up to 1,700 head of ewes and some cattle, but Douglas said that he finally lost too many sheep in the all too common late April or early May blizzards that Rockypoint tends to get, causing him to finally sell the sheep and make the switch to all black Angus cattle. "We live in real bad winter country," he said. "We've got a ridge of timber behind us and it drops over on what we call Lightning Flats. We get a lot of snow and more rain than most people in this area. I've lost as many as 400 sheep in just one of those three-day blizzards, two or three times." Losing that many head of sheep was a challenge, so when the ranch switched over to black Angus cattle, the bad winter conditions helped them decide to push their calving date ahead, to the first of June. "I read a story once about an old boy in Montana and he said he's never seen a calf chill down in his mama's belly," Douglas said. "The calf never sees a bad day and we don't have to fight no storms in the spring, hauling in chilled down calves. The cows calve good, they breed back good and it works perfect for us." Despite the challenges that winter presents, Douglas says that there are no real challenges that hard work can't remedy, especially when you have good family around. Of his three children, his only daughter and youngest son live and work on the ranch, along with a few grandchildren and great-grandchildren. 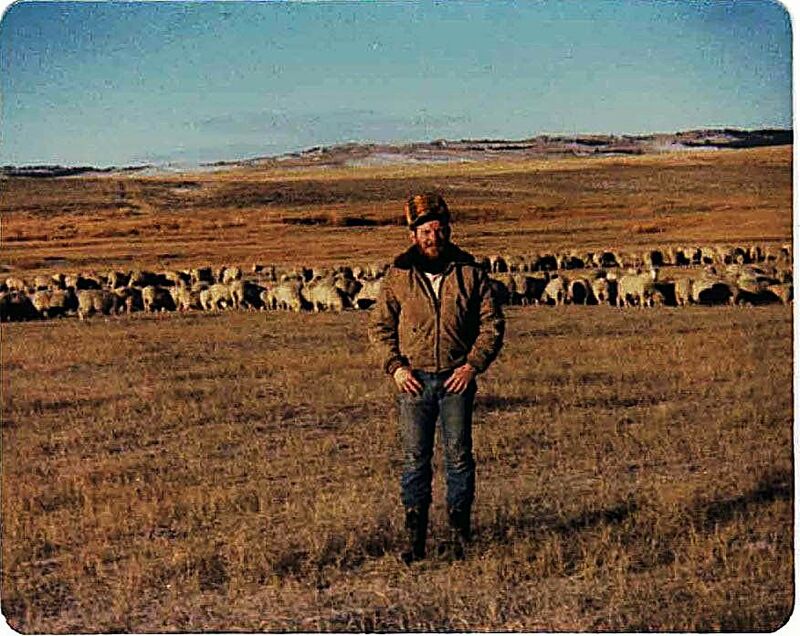 Douglas didn't want to sell the ranch and considers himself fortunate that his children are willing to take on the responsibility. "It wasn't too hard to turn it over to them and leave them alone," he said, adding with a laugh that he still lends his expert advice from time to time. "But I've had some health problems so Lisa and Kyle run my cows. We have a lease type deal set up where they take care of everything and Betty and I have plenty to live on and that's all I care about." 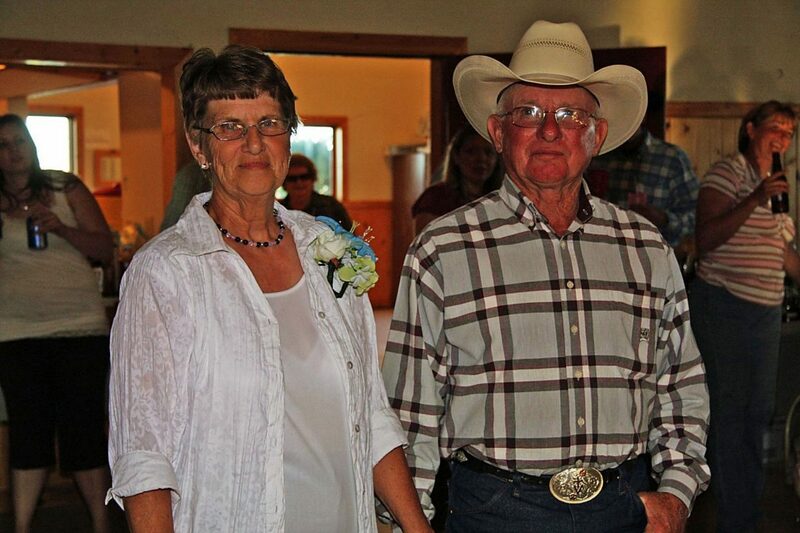 When Douglas purchased the ranch, he had to purchase it outright from his family. His father had added onto the original homestead by purchasing two places along the Missouri River. After Douglas took over, he continued to add onto the ranch as the time and situations allowed. With the price of land then compared to now, he's thankful he had the opportunities when he considers that on average, he paid around $90 per acre, with the most he ever paid being $600 per acre. 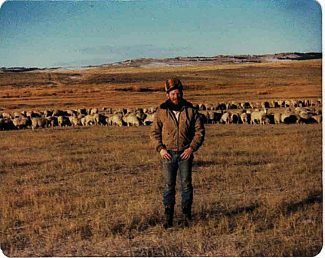 Of course, lamb and calf prices then compared to now are very different, but Douglas is glad that his children won't have to pay the big price for land that he did. "They'll work hard regardless, because that's what they do," he said. "But they won't have near the worry that I did." While the pressure that caused him may have been one of the reasons Douglas was such a hard worker, the lesson of working hard is something that Douglas instilled in his children from a young age, and it is a lesson they won't soon forget either. "We had the very best childhood and maybe we didn't have a lot, but we had everything we wanted," Lisa said, recalling how they would come home from school and the greatest thing was to go to the lambing shed to go clean lambing jugs. "I can remember lambing outside in March and these storms would hit, we'd go chase the lambs down and put lamb jackets on them, then when it got nice you'd have to chase them down again and take the jackets off," she said. 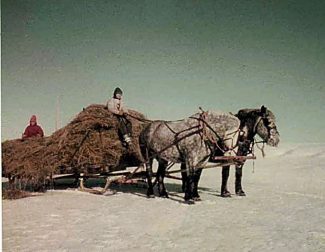 They didn't use horse trailers to get to where the cattle were, so Lisa recalled waking up very early to get horseback work done before the heat of the day, but it never failed that her mother would always have a huge breakfast of pancakes ready for the family. Today, they mostly use four-wheelers to get around for the sake of convenience. In the past, Douglas recalled feeding with the team. Twenty years ago he bought a round baler and hasn't looked back. "I really like teams, but you've got to be young for it because we had loose hay then, and pitching it was work," he said. "But oh, I love a good team." One of his teams he bought at a horse sale in Belle Fourche, S.D. They were two older saddle horses that he hooked up to the wagon. "I was a little worried about it, I guess they were probably 13 or 14 years old," he says. "I threw the harness on them, hooked them up and turned them away and they were touchy for a half a mile but from then on, they were so simple to break to driving." The last team he had was a pair of Percheron draft horses that he bought as young colts. Douglas said he fed with them for around 10 years. The team was so used to him, that when he handed the lines to his daughter the horses felt the change and started going "faster and faster and faster." As soon as Douglas took the lines back, they'd slow right down. Lisa said that hard work and dedication comes from older generations. She learned it from her father, fortunately her children learned it as well, and her grandchildren are being raised the same way on the West Ranch. "I was born and raised here," Douglas said. "I like cattle and sheep. It's all I knew, all I know and all I've ever done."